Christian Life with Michael: New ORU Web Site! How could I have forgotten to mention this? A couple of months ago I started a new job at my alma mater, Oral Roberts University. A big part of this first couple of months for me has been helping prepare the university Web site for a re-launch; the screen shot you see on the right is the main page of the terrific new version of our site! There are a number of things that are cool about this. The first thing you'll see if you visit from a computer is that the background is moving video! The next thing you'll notice is that there are huge links to most any major area you might want to visit on the site. If you visit the site from a mobile device, it still looks great - not like a site designed for a desktop browser that you have to pinch-zoom to view from your phone! The big links are still there, and every page looks great on your tablet or cell phone. The "Explore Majors" section (you can get there from the home page link in the top left, or using this direct link: http://www.oru.edu/academics/explore-majors/) - it looks great, and you can filter it down to a specific department, or just search for what you want to see. The new "Chapel Services" page (at http://www.oru.edu/chapel/) which looks GREAT, is easier to navigate and watch the videos - and when chapel is in progress, will allow you to watch it live! If you want to take a campus visit right from your computer, we've added a Virtual Tour at http://www.oru.edu/virtual-tour/ which will make you feel like you've actually been here. Please visit the site and take a look around! 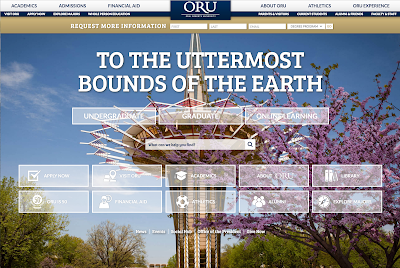 ORU is a terrific place (I wouldn't have come back here as an employee if it wasn't), and we wanted the Web site to match.